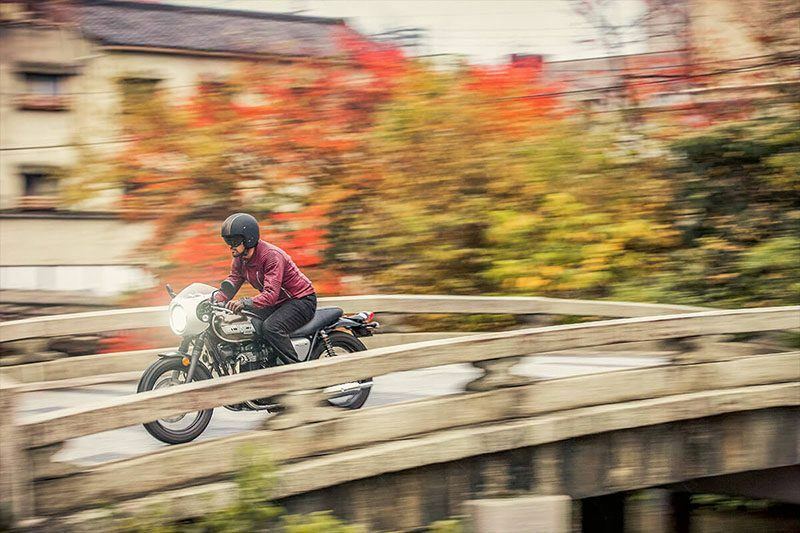 Iconic 1966 W1 heritage runs deep in the all-new 2019 Kawasaki W800 CAFE retro motorcycle. The spirit of the original W1 has inspired the inception of such legendary machines as the Kawasaki Z1 and Ninja H2™. Preserving the authenticity of the W1, the W800 CAFE has been modernized for trailblazers who prefer to ride to the throaty roar of timeless performance. 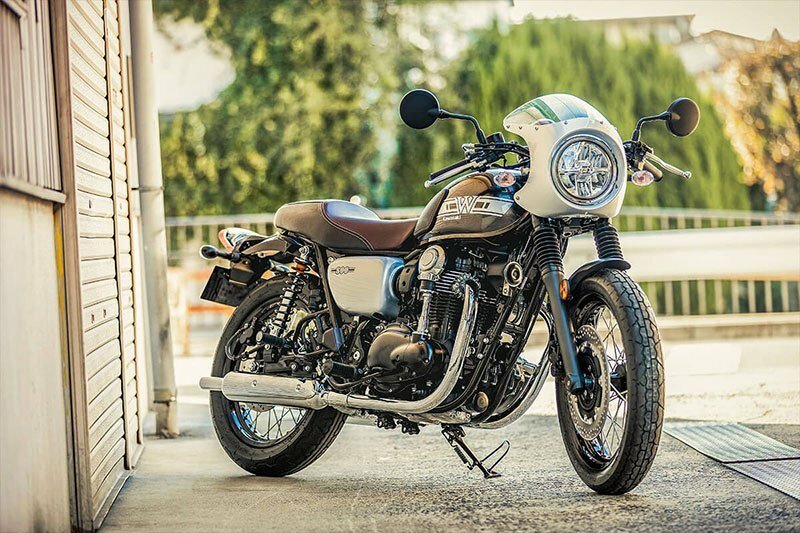 The W800 CAFE pays homage to the original icon with café-racer styling while incorporating modern technology and handling. 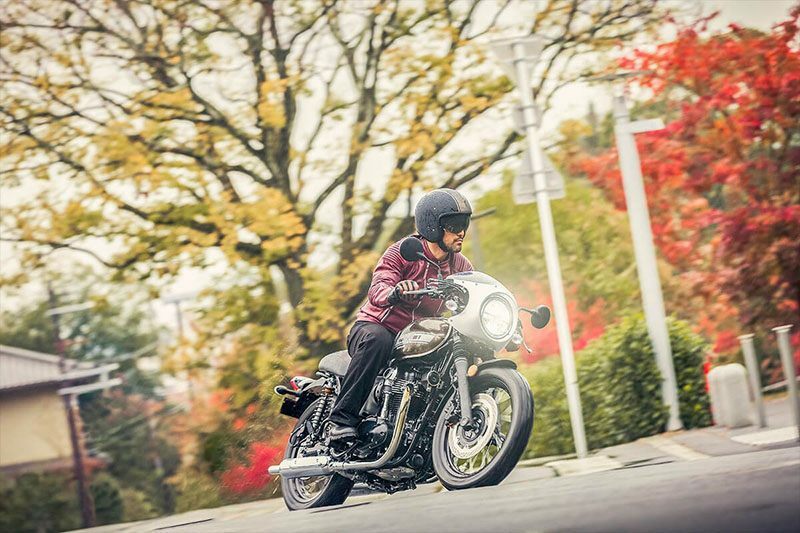 Ride in comfort with a clubman-style handlebar and a two-person café seat while a café-racer front cowl completes the retro racer image. 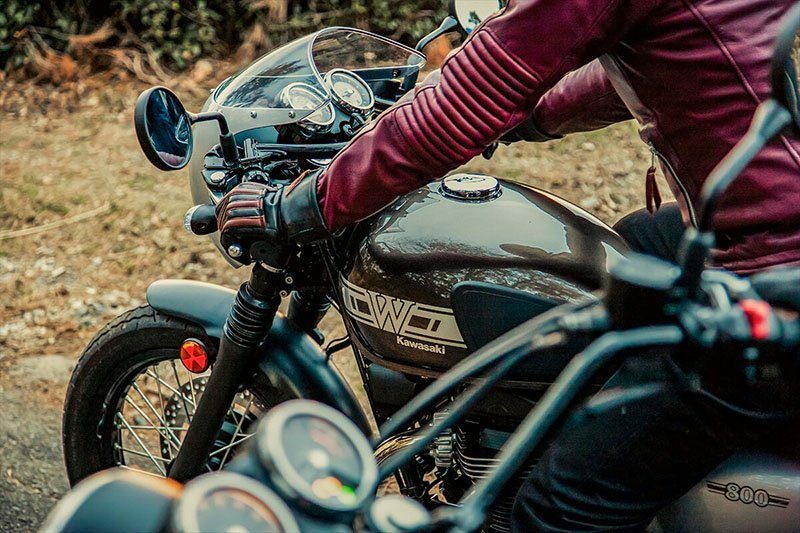 CAFÉ-RACER STYLE FRONT COWL: A café-racer-image front cowl helps deflect wind while adding to the vintage aesthetic. CLUBMAN-STYLE HANDLEBAR: The forward-leaning clubman-style handlebar offers a sporty, racing-inspired riding position. BLACK ALUMITE RIMS: Lightweight aluminum spoked wheels are resistant to corrosion and feature rims finished in black alumite for a timeless look. 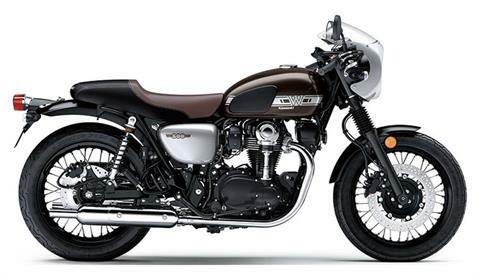 CAFÉ-RACER SEAT: A stylish two-person café seat is designed for comfort and sporty good looks. BLACKED-OUT ENGINE: The silver bevel-gear cover on the blacked-out engine draws attention to the engine’s unique design while adding a quality accent. Stylish two-person café seat is designed for comfort and sporty good looks, featuring a tapered front for an easy reach to the ground. 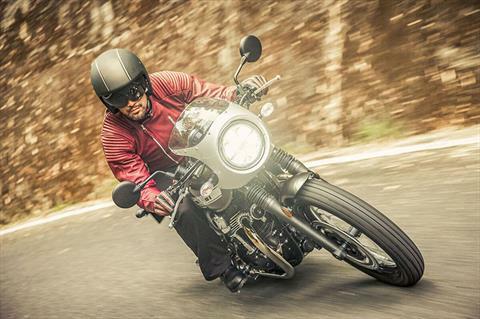 Relaxed, neutral riding position offers comfort, making the W800 CAFE ideal for a wide range of riding applications. Compact switchgear gives the handlebar an uncluttered and vintage appearance while modern internals ensure reliable performance. M-shaped clubman-style handlebar contributes to a sporty riding position. 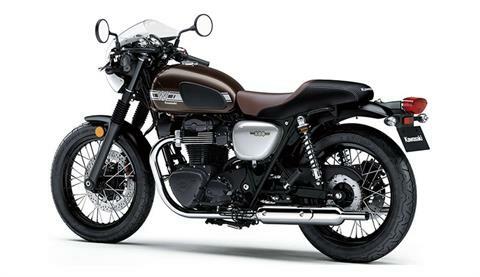 5-way adjustable clutch lever and 4-way adjustable brake lever enable riders to fine-tune lever position. DUAL REAR SHOCKS: Dual rear shock absorbers with adjustable spring preload offer a smooth ride and a clean look. CLASSIC EXHAUST SYSTEM: Classic, retro muffler design emits the throaty exhaust note that makes parallel-twin engines infamous. 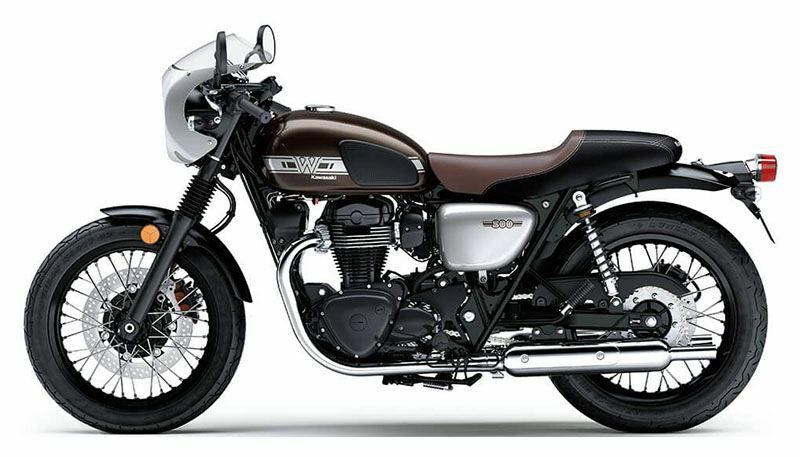 Twin mufflers with carefully tuned internals deliver the characteristic note of the vertical twin’s 360° crankshaft engine configuration—a throwback to the original W1. 773CC VERTICAL TWIN ENGINE: The vertical twin-cylinder 773cc four-stroke engine features a distinct bevel gear-driven camshaft and SOHC 4-valve head and is tuned for low- to mid-range performance for abundant torque, while modern fuel injection provides clean operation. ASSIST & SLIPPER CLUTCH: The addition of an Assist and Slipper Clutch provides a lighter feel at the lever and a back-torque limiting function that helps prevent rear-wheel hop when aggressively downshifting. DOUBLE-CRADLE FRAME: Designed using Kawasaki’s advanced dynamic analysis software, the frame utilizes a sturdy 50mm square-section backbone that is complemented by round pipe downtubes for classic style and modern ride quality. LARGE DIAMETER TELESCOPIC FRONT FORK: Stout 41mm stanchions minimize flex and stiff fork springs soak up bumps on well-traveled city streets. Rubber gaiters are used to protect fork tubes and ensure long fork seal life while adding to the retro appearance. DISC BRAKES WITH ABS: Stopping power comes thanks to an ABS-equipped braking system that features a large diameter 320mm front disc brake paired with a 270mm rear disc brake for excellent response and strong stopping power. 18 IN. WHEELS: 18 in. 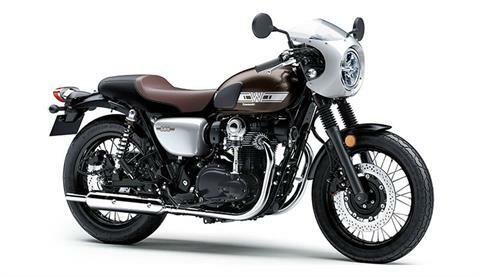 front and rear wheels provide sporty handling while maintaining the look of a true vintage café racer. Adding to the corrosion-resistant aluminum rims, the spokes feature a special coating that helps keep them clean. ICONIC AIR-COOLED VERTICAL TWIN ENGINE: An air-cooled fuel-injected vertical twin engine preserves the striking visual impact of the original 1966 W1 model. The iconic bevel-gear-driven cam adds beauty to the cylinder head while reinforcing the engine’s classic appearance. ELEGANT MUFFLER DESIGN: Simple yet elegant muffler design comes thanks to smooth curves and long lines, featuring peashooter-style silencers with slim chambers and long tailpipes. SCULPTED FUEL TANK: The striking curves of the fuel tank naturally draw the eye, further adding to the style element. Its volume gives it more presence for a powerful impression. TRADITIONAL INSTRUMENTATION: Individual speedometer and tachometer exhibit classic display design while a simple LCD screen and complete set of indicator lamps add a modern flare. Beneath the retro-styled exterior, modern internals ensure accurate and reliable performance. ROUND LED HEADLAMP: A large 170mm LED headlamp casts a bright, white light. Ensure the path is lit with six total chambers, four for low beam plus an additional two chambers that illuminate for high beam. Position lamps in the high-beam chambers ensure the whole lamp appears lit, like a retro-style bulb headlamp. Details like a convex lens and chromed headlamp ring speak to the high-quality, classic design.